Samuel's Kisses is a delightful new children's picture book, written by Karen Collum, illustrated by Serena Geddes and published by New Frontier (2010), just in time for Christmas! When Samuel and Mummy go shopping, Samuel somehow manages to transform tired or grouchy people through the simple act of blowing a kiss. Young listeners will relish tracing the path of the blown kiss, while parents will appreciate all the opportunities for learning in the book - like the fact that Collum builds tension by having the kiss go over, under, behind and through things, reinforcing positional vocabulary at the same time. I believe parents will also love that the story celebrates the power of children to have a positive impact on the world, no matter how young they might be. Geddes' illustrations are filled with exuberance and humour. My favourite page is where the old man with a walking stick takes on a Fred Astaire flair after he receives his blown kiss. The line drawings and watercolour pictures are simple enough for pre-schoolers, but have loads of personality and pizzazz. 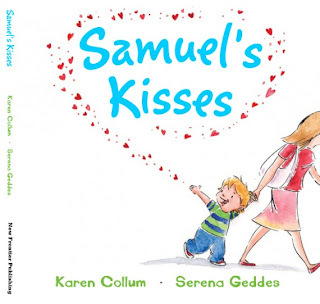 Samuel's Kisses is just the right size for little hands but hard-backed and sturdy enough to be shared over and over again. It would make a perfect acquisition for schools, homes and public libraries. Kids need books that make them laugh, make them think, and give them hope. Samuel's Kisses will do all three. Read more about author Karen Collum's strong belief in teaching children to be optimistic in her guest post at The Book Chook, Optimism: More Than Whistling a Happy Tune.